District leaders were initially attracted to Science Techbook because of its deeply rooted connection to NGSS. Powerful model lessons give students a relatable anchor point for learning about the world around them, inspiring them to discover the passion of a scientist in each of them. 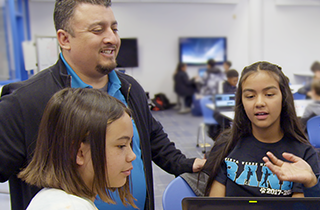 Students at Val Verde Unified School District are getting a head start in classrooms, where an innovative combination of leadership, vision, and technology is driving achievement. Even from the earliest grade levels, lessons in science, technology, engineering, arts, and mathematics (STEAM) are woven through each classroom experience. Val Verde educators also recently made the leap to Next Generation Science Standards (NGSS), using Discovery Education Science Techbook for NGSS to reinforce instruction. Val Verde’s STEAM Coordinator Doug Henderson said Techbook’s focus on real-world, relevant phenomena has been a huge win for Val Verde’s schools as they transition their classrooms to NGSS. District leaders were initially attracted to Science Techbook because of its deeply rooted connection to NGSS. Powerful model lessons help teachers give students a relatable anchor point for learning about the world around them, inspiring them to discover the passion of a scientist in each of them. Techbook’s ability to switch the text between English and Spanish languages on-the-fly, along with a text-to-speech function, added up to another big plus for Val Verde’s set of diverse learners. “After showing our elementary teachers they can teach reading and writing using science as the hook, and have it speak to you in English or Spanish, we all signed off on Techbook being the best product out there for us,” said Henderson.